The Kindle 2 and Kindle DX were both on sale at a Beijing electronics bazaar, where they and many other devices, such as the iPhone, are resold by unofficial vendors who have obtained them from outside China. Amazon’s Website says it is currently unable to ship Kindles or offer Kindle content in China. But the devices are already being sold on Chinese Web sites and at least one stall in a Beijing electronics bazaar. 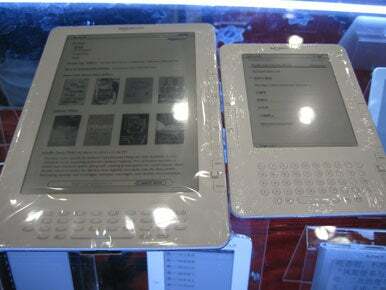 Kindles are also being sold by users on China’s Taobao.com, an auction site similar to eBay. A search for “Kindle” brings up several hundred results on the site. A 3G wireless coverage map on Amazon’s Web site includes certain Chinese cities, suggesting that the Kindle’s 3G link would work through a Chinese carrier.